The first thing I need to say is this – all the money that people contributed to the Bob Colby Moving Fund via the “Do The Bob” show and individual contributions is still sitting in its own account, and will be used for its stated purpose when I actually manage to move. The question is when that will be, and the short answer is that I’m not sure right now. I’m used to the Boston housing market (where it’s not that unusual for people to fork over a substantial share of their income in rent), so I assumed that since I had budgeted things out so that I could handle $650 or so in rent, it meant that I would be able to snag one of the places in that price range (in the Durham, NC area) – there aren’t that many and they might not be the most desirable, but they do exist. Well, I was wrong. I spent a few days in Durham last week and the standard appears to be that your income must be three times your rent. And by that standard it looks like my modest Social Security check would not qualify me to live on my own anywhere in this country, with the possible exception of a run-down trailer park somewhere in the outback (actually, I would consider that if there was one within walking distance of a bus line, but I couldn’t see one in the area I was looking). However, there is a range of fairly attractive two-bedrooms that I *could* afford if I had a roommate (assuming that they had a similar income to mine). So I will be trying to put together a friends-of-friends network that will hopefully uncover a suitable roommate in time (based on my roommate history before I found my current situation, I’d rather have some way to vet people as opposed to dealing with total strangers). That said, what do I do for the moment? If you’ve been following the story, my main reason for doing this is so that I don’t completely exhaust my steadily-dwindling retirement savings (which at the current burn rate will be gone in less than three years). Since this moving project is going to take longer than I thought, I’m going to have to do some serious budget-cutting to close at least a part of that gap. Among other things, that means I won’t be able to play the scene-supporter role nearly as much as I have in the past. So if you don’t see me around all that often from now on, I hope you’ll understand – I’ll do what I can, when I can. In the meantime, I will continue to downsize, so as to be better able to jump on any opportunity that might present itself. I’ve been an Apple guy since 1984, when I saw my first Mac (which *was* the first Mac). It had a whopping 128KB of memory. That’s KB (1024 bytes), not MB (each one of which is 1024KB), and certainly not GB (each one of which is 1024MB). I’m not even sure how many Macs I’ve had since, but it’s a lot. I had the first iPod, the first iPad. My first smartphone was an Android, but eventually I took the plunge and worked my way up to an iPhone. But now it all changes. A lot of you know that a main driver of my planned move next year is my budget issues – I can’t afford the Boston area anymore. In advance of that move, my tech is starting to move as well – from the Apple neighborhood to one where I don’t have to constantly worry about whether I can afford to replace devices that have reached the end of the line. The most radical part of the change will be replacing my Mac Mini with a Chromebook. Above and beyond the low cost, the lightness of the environment attracts me. No matter how much I bumped up memory and storage on my Macs, that spinning beachball would never stay away for long. Assuming I can discipline myself as far as the number of tabs I keep open, things should go a lot faster. And yes ChromeOS is mainly just a browser, but web apps exist for just about every purpose these days. As for file storage, I’m going to put everything I can up on the cloud (currently transferring my iTunes library to Google Play Music – I think I can live with the 50K song limit), and archive some things (like video) to USB drives. What storage there is on the Chromebook is flash, so it’ll be faster and I won’t have to worry about hard-drive crashes anymore. What about tablets? My first-gen iPad Mini is approaching end-of-the-line status, it no longer supports all features of the latest iOS releases. I’m sure the next step (not being able to update the OS at all) will come soon, followed by app makers dropping support as well. And while I’ve loved the compact size and low weight, I’ve come to realize that my aging eyes need a larger screen. So I’ve begun to transition to a 9.6 in. Android Samsung Tab E. It’s definitely got more heft to it, but the speed and reading experience are markedly better. I know Instagram is designed to be a phone app, but you should see what pictures look like at the larger size, you can really see a lot of detail that’s not apparent on your phone. Speaking of phones, that will be the last stage. My current iPhone has eight payments left on it, and after that’s paid off I’m going to enjoy the lower monthly phone bill as long as I can. But I’m pretty sure my next phone will be an Android as well. Hopefully by then I can find an affordable model with the forthcoming Android N, which I hear will have the automatic OS updates that Apple is famous for (no more waiting to see when and if your phone will be updated). So that’s one part of my moving plan. Have finances affected your tech choices and future plans as well? It’s been more than three months since I updated, and I guess I should let you know how things are going with my hip. I just checked my last post (Jan 4th), and apparently it took even longer than I remember for the cortisone shot to get me back to 100% – I was thinking I was back to normal by mid-December (about a month after the shot), but it seems I still had a little ways to go by early January. So it’s been a bit more than three months since I could no longer even notice any symptoms of the condition that had become the dominant fact of my life, the determining factor in what I would or wouldn’t be able to do on any particular day. I now also have some clarity regarding my underlying condition – since the hip joint shot eradicated my symptoms without needing to do anything with the bursa, it’s definitely arthritis rather than bursitis that’s the problem. But three months is also about the length of time that the specialist thought that the shot would last, so it’s impossible to take any of this for granted – symptoms could return at any moment. I know that there’s a limit to the number of cortisone shots I can have, and that hip-replacement surgery could still be in my future. But for now I can focus on the next big task – getting myself to a more-affordable part of the country. More about that next time. “Get the damn cortisone shot!” This was the constant advice from my dear friend Mary Lou, who got tremendous relief from it when she had her own hip-related problems. Others echoed the advice, but it took me a little while before I was able to act on it. First I had to get an appointment with a specialist (that’s where I was when I wrote the previous entry). After looking at X-rays, the specialist decided that this was more arthritis than the bursitis my PCP had diagnosed (although there might be some of that as well). So he decided I should get a cortisone shot in the joint, and if significant pain remained we might try another one in the bursa. While all this was happening, the Vanyaland blog was kind enough to take notice of my situation – thanks again to Michael Marotta (as well as Matt Graber and Sasha Alcott for the amazing quotes). I got the shot on Nov 23. It was supposed to take seven days to work, but I was told it might take as long as ten. So I wasn’t very happy when two weeks passed with no improvement. Luckily I had procrastinated in setting up a follow-up appointment with the specialist, since it was on the evening of the 15th day that I started to notice a lessening of symptoms. By the time I got to the specialist’s office, walking and standing had become much easier. It still hurt to stand completely straight (like a soldier at attention), but even that was manageable. So the specialist decided we wouldn’t do anything more for now, and that I should come back if things got bad again. I asked him how long I could expect relief to last, and was told it could be any time from a few days to months. So I’m guessing this isn’t a permanent solution. i asked him if a hip replacement might be necessary if things did in fact get bad again, and he agreed that it might be. So I guess we’ll just have to wait and see if that happens. In the meantime, things have continued to improve. I wouldn’t say that I’m 100%, but I’m no longer ruling clubs out for inadequate seating, or worrying whether I can get through an errand. The cane is still at the bottom of my stairs if I need it, but I’m hoping I won’t for awhile. 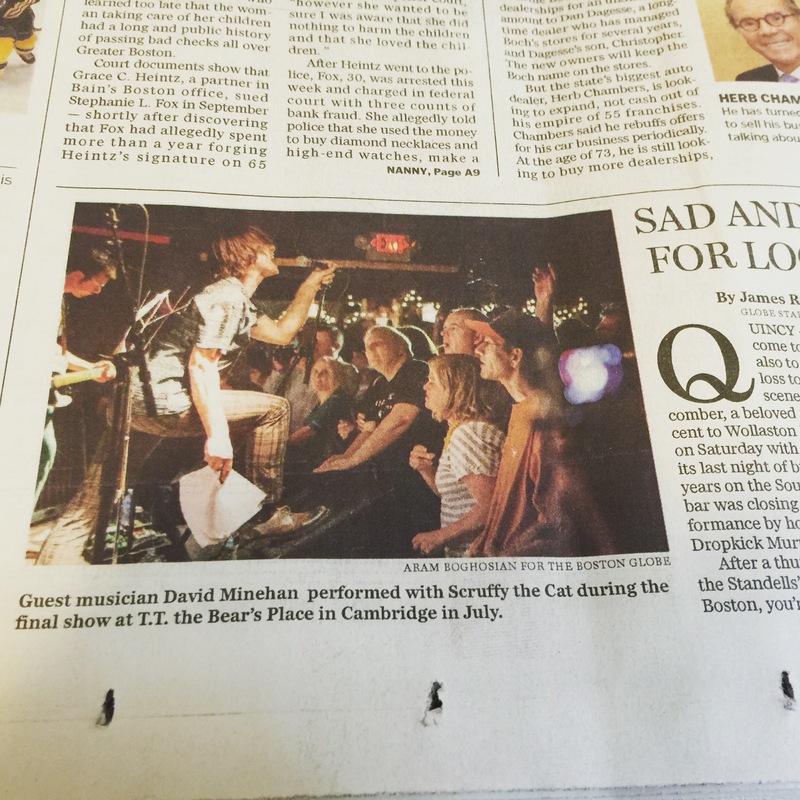 This photo from July (which I first posted on Facebook after the Boston Globe used it a few weeks ago) represents me as I’ve always wanted to be at shows – front and center, in the thick of it. Alas, that may not be the case for awhile. I’ve been dealing with increasing leg pain for a few weeks now, and in my doctor’s opinion (subject to confirmation by orthopedic specialists) I’ve developed bursitis in my hip. It’s not fun. I’ve been learning to cope, but until this is fixed I’m going to have to spend a lot less time on my feet. Naproxen (basically a prescription-strength version of Aleve) seems to be helping a bit, but there are still a lot of changes to adjust to. I can’t go on long walks anymore. I have to be very quick and know exactly what aisles to hit if I do a supermarket run. The worst of it is the effect on my life as a music fan. There’ll be venues I simply can’t go to – too long a walk from the T and/or not enough comfortable seating. So many of my friends are musicians and I won’t be able to support them as much as I’m used to doing. And when I do go I won’t be spending much time in my favorite place – front and center. Rest assured, my next (and last for 2015) show (on FRI, NOV 6 at STORE 54 in Allston, featuring WHEN PARTICLES COLLIDE and ENDATION) is on and I will definitely be there, but if you see me somewhere besides my usual place, don’t think it’s because I’m not excited by the music I still have the honor of presenting to you. Hopefully this will be behind me when I get back to doing shows next March. If you’re long-term unemployed like me, your days have to have a focus or you’ll go a little nuts. A few years ago, my focus was on shooting and uploading as much live-music footage as I possibly could (which is why I have over 900 clips on my YouTube channel). Then starting in late 2012 my focus began to shift to the promotion of my monthly (with some breaks) shows (first at the Rosebud, then at the Cantab, and now at Store 54), which is one reason I’ve only put up 20 clips so far this year. Now there’s something new, which is why I was actually relieved when my current venue proposed I cut back to four shows a year in 2016 and beyond. I put a lot of time and thought into these shows, and don’t want their quality to suffer just because I have less time to work on them. What’s this new thing that will require more and more time going forward? Essentially, it’s a project to massively downsize some 40+ years of random accumulation (books, music, magazines, comics, mementos) into the much smaller space I will have available when I move (projected date Sept of 2017). At the same time, I have to learn everything I can about my intended destination (Durham, NC), make some connections, eventually go down to scout out various apartment buildings, etc., so combined with the amount of stuff I have to sell (if I can), give away, toss and eventually pack, it actually is going to keep me busy for the next 686 days (the time between now and Aug 31, 2017). There’s still a lot of stuff up in that attic. So, that’s how my time goes these days. Every week there’s the Sunday visit to the attic, the Tuesday trip to Harvard Bookstore (with the most salable books), followed by the library donations and the attempt to fit the books I just can’t part with into the space available. In the meantime I’m cataloging my huge comics collection (and finding out just how little it’s worth now). I’m trying to figure out what price to ask for my vintage rock/punk zines. Soon it will be time to find out if anyone still buys CDs. Eventually that attic full of books will empty out and there will still be way too much (of everything) to take with me. Then the *hard* questions get asked – which memories are most precious? I just cancelled my paid hosting plan at another provider because renewal is coming up and I realized that the functions I really need can be handled by a multi-page wordpress.com blog without recourse to a self-hosted account. I’ll be building back in the other functions (links to my shows page et al. fairly soon.